Amethyst is known as the "Spiritual Stone''. It is attuned to the crown chakra and is effective in stimulating the intuition and spiritual awakening. It is an excellent aid to those wishing to develop psychically and provides protection to those who believe themselves to be under psychic attack. 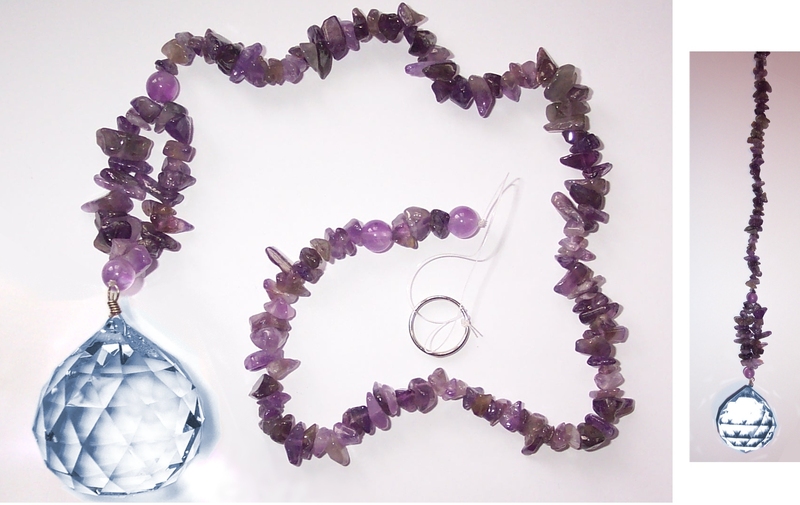 Amethyst has a calming and soothing effect and is believed to especially effective in times of grief. Turn ordinary sunlight into a shimmer of rainbow magic by hanging this multi-faceted crystal sphere in a sunny window. This sphere is strung on Amethyst gemstone chips and is ready to hang, making it a stylish hanging ornament. Hang a Violet Crystal in your window to energise your room and activate positive chi (positive energy) and to create beautiful rainbows as the sun shines through the crystal.